Thanks to excellent sensor characteristics with a class 1 laser, a wide scope of functions and intuitive use, SensoPart’s triangulation sensor FT 55-RLAM represents a new generation of distance sensors. The sensor is available in several different operating ranges, extending up to 1 m.
The new compact distance sensor FT 55-RLAM from SensoPart is a true allrounder, reliably detecting surfaces from black to shiny. Equipped with an analogue output, two switching outputs, an IO-Link interface and optional RS485 interface, the sensor offers extensive connectivity. It also comes with an innovative and user-friendly operating concept with a large LCD display, which is unusual in this price range. This unique combination of characteristics makes the sensor ideally suited for diverse applications, for example in machine construction, the automotive, plastics and packaging industries or in robotics applications. FT 55-RLAM owes its high detection efficiency to three main characteristics: Firstly, the oblong light spot supplies a clear signal even on structured metal surfaces, thus guaranteeing high repeatability. Secondly, high signal amplification allows reliable detection of poorly reflective black parts, as well as shiny objects. This performance is not just in selected instances, but is consistently guaranteed across the entire measuring range. And thirdly, measurement reliability is further increased by improved signal evaluation. Thanks to a wide scope of functions, the distance sensor offers users numerous options. Different special functions that cannot be implemented via the control system in fast-moving processes, can be easily integrated without programming work – such as the output of profile height difference or the determining of a minimum or maximum value. The sensor also comes with extra useful functions for setting switching outputs, such as an event counter or pick-up or drop-out delay. To ensure simple access to all of these functions and their ease of use, SensoPart has opted for a large LCD screen featuring soft keys, in place of the standard cryptic 7-segment display, for enhanced user comfort. Ready for industry 4.0 with IO-Link The FT 55-RLA distance sensor is a completely new development, designed from the beginning to meet the coming requirements. The standard version with a 5-pin connector is equipped with an IO-Link interface. This enables direct communication with the sensor, for setup and switching between different sensor configurations. Alternatively, there is also an 8-pin version with an integrated RS485 interface. Two sensors can therefore be used in master/slave mode, e.g. for double layer detection or thickness measurement. Besides offering an extensive range of functions and easy use, SensoPart’s new distance sensor also comes with everything it requires to guarantee reliable operation. The FT 55-RLAM is equipped with a robust, hermetically-sealed metal housing (IP 69/ IP 67) of compact dimensions and a highly resistant metal connector. Clever accessories, such as the SensoClip mounting component, enable easy mounting and fine adjustment. 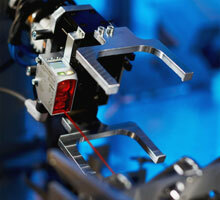 As a laser class 1 sensor, it can be operated without additional safety measures.